So 2009 draws to a close and this blog, which debuted at the end of January, ends 11 months of life. Marc Lynch already did a People of the Year 2009 post for the Middle East, so I won't go there. But there is the Iron Law of Reporting which says everybody must do an end of year roundup. I've already done my top five hits (previous post), but need to do something more. Man of the Year: Nobody really stands out. Maybe the late Hossein ‘Ali Montazeri or Mir-Hossein Moussavi. Woman of the Year: Dead easy. The late Neda Agha Soltan. Winners: Oddly, both Bashar al-Asad and Sa‘d Hariri. Also: Crown Prince Sultan (for the comeback), and depending on what happens next, maybe Nuri al-Maliki. Losers: Dubai, Al-Qa‘ida, Mahmoud Ahmadinejad, Mahmud ‘Abbas, possibly Nuri al-Maliki (see also "Winners"), and perhaps Gamal Mubarak. Most Over-Reported Story: Gilad Shalit is about to be released. (As I write this, have you heard: the release is imminent! Again.) Also the flurry of fervor about Mohamed ElBaradei and ‘Amr Moussa's bids for President of Egypt, unless you can explain how they stand a constitutional chance. And the Afghan decision. Most Under-Reported Story: Human rights just about everywhere. Also minority rights in Iraq: Christians, Yazidis, Turkmen, Shi‘ites in Sunni areas and vice versa. And, as always, the expansion of settlements in the West Bank. Stupidest Story: Egypt's mass hamicide. Swine flu isn't spread by swine; killing Egypt's pigs further impovished the already-impoverished zabbalin, who depended on the garbage they collected to feed their pigs, and . . . oh, you've heard this from me already. Best Speech: Obama in Cairo. Worst Speech: What else? 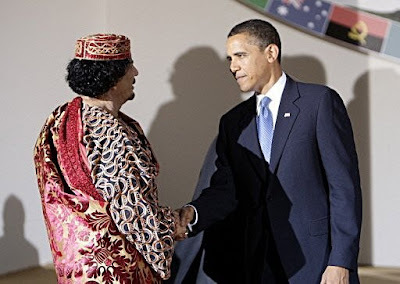 Qadhafi's "stream of consciousness foreign policy" speech at the UN. He left out Bigfoot and the UFOs, but not much else: he got the Kennedy assassination in there. Best Election: Hard one. Israel or course went smoothly if I didn't love the results. For the Arab world, Lebanon I guess, since it seems to have been fair, but it took forever to form a government. Worst Election: Need you ask? Unless you count farces like Algeria and Tunisia, obviously Iran's. Those Qatari Coup Rumors. Posted, oddly enough, while I was on vacation, and purely derivative, but it still gets hits. "She was a Splendid Beast": The Arabic Transliteration Problem. One of my own favorites; glad others agree. More Mousavi Fever: Rafsanjani Attacks Ahmadinejad. Nothing brilliant here; just commenting on Iran, but at the height of the furor. Later addendum: and Gary Sick linked to this on the Gulf 2000 listserv, which is a real draw, and at his blog. Fun with Google Earth: Middle Eastern Airbase Recon. I had fun doing this, and I'm glad many of you liked it. I may post other greatest hits later, but here's a start. Only two of the top five (nunbers three and five above) are really my own work, but that's the way it goes. I am shamelessly cribbing this from Chapter XXXI of the late Otto Meinnardus' Christian Egypt Ancient and Modern, (Cairo: AUC Press, 1965; Revised Edition 1977). Meinardus was a major figure in Coptic studies; German-born, he wrote mostly in English or French, taught at the American University in Cairo, and was an ordained Lutheran pastor. (Judge for yourself what Martin Luther would have thought of some of these stories.) He died in 2005. But I have to condense all the details considerably; his chapter runs over 40 pages. There's also a detailed online site, with pictures (text approved personally by Coptic Pope Shenouda, they say), for those interested. And tours are available. 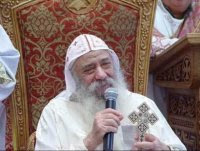 With Western Christmas behind us (though the 12 days of Christmas are still running), but Eastern Christmas still ahead, there's some concern about the health of Coptic Pope Shenouda III. A few months ago I posted on questions about the health of Shenouda III. Now there is a new question: the Pope apparently "swooned" or fainted on December 24 (not Christmas Eve for the Copts, who use the Julian Calendar and celebrate January 7). On the other hand, a word of caution here. I've been Googling in both English and Arabic and haven't found much in the way of reportage of this outside of Al-Masry al-Youm. English Google brings up only this article; Arabic brings up a lot of articles on the Pope's supporting the government effort to ban illegal organ trafficking (a "well, duh" story as we call it in the scholarly community), and not much else. This may be a gross overreaction, but then, Al-Masry al-Youm, despite a fairly good track record for an independent newspaper, did help turn the Swine Flu into the mass hamicide earlier this year. Probably nothing to see here. Keep moving. The violence that tore through Iran on ‘Ashura certainly suggests that the discontent that has been rising since the Presidential election has not abated; the fact that the crowds are now denouncing the Rahbar, Ayatollah Khamene'i, rather than Ahmadinejad and that there are reports of some police and security forces refusing to fire on the crowds or even joining them shows that the legitimacy of the regime is crumbling. But does that mean it will fall? Here I think there are a number of reasons for caution, despite the clear levels of discontent. As others have noted, the protestors are mostly urban, middle-class, often students and young professionals. Many who know Iran better than I claim that there is still a lot of support in the rural areas and among the poor for the Islamic Revolution, with which Khamene'i and Ahmadinejad still identify. The regime has lost the intellectuals and the middle classes and many of its own moderate faction. An Iranian professor of my acquaintance who recently returned to the country was visibly nervous about going home. Clearly things aren't well. Sometimes authoritarian states — and Iran seems to have become one even if you didn't class it as one a few years ago — can last a long time after legitimacy is lost. There are still aspects of the government's policies that are popular in many quarters of Iranian society — and the nuclear project is one of these, though not all US policymakers get that fact — and the lack of a charismatic leader, and continuing solidarity of the Guards Corps, mean the government can weather a lot of protests at this point. The question is: can any of this change, as it did for the Shah? First, the leadership issue: there is no exile figure to play the role of Khomeini in the 1970s; the internal opposition is obviously under enormous pressure. Moussavi and Karrubi and former President Khatami and their allies are vulnerable to pressure, even to arrest and prosecution. Rafsanjani is probably immune to those things, but his wealth and alliances make him an unlikely Robespierre. Perhaps he will prove to be a behind-the-scenes manipulator who outmaneuvers the present leadership: that I think would be the likeliest scenario for change, but it's leadership change, not regime change. Who else? There are quite a few Iranian groups in the West but they tend to be headed by academics, not charismatic leaders. Reza Pahlavi? The Pahlavi dynasty had awfully shallow roots anyway, and I don't think many Iranians want a monarchy. He could possibly win election if only the Iranian community of southern California (and only they) were voting, but otherwise, nah. Now, sometimes vacuums can be filled. Khomeini was an unlikely figure to become the icon of a revolution, and lots of other forces thought they could use him to bring down the Shah, then do things their way: instead he used them. In 1770 a few Americans had heard of Samuel Adams, George Washington, and Patrick Henry, but only the first was a real activist, and today is more remembered for the eponymous brewery than his actual revolutionary agitation. When the Bastille fell Danton and Robespierre were still rising figures and Bonaparte unknown outside Corsica. So there may be someone waiting in the wings. The other big question is the military, and in Iran that really means the Islamic Revolution Guards Corps, the IRGC or Sepah-e Pasdaran. So far, their ranks haven't cracked. Khamene'i is their patron, Ahmadinejad their creation. (But then, Rafsanjani is their father, so to speak, and may still have some clout there.) Gary Sick has called our attention to a piece by Ali Ansari at The National Interest called "The Revolution will be Mercantilized," which notes the IRGC's involvement in the economy. The IRGC has way too much invested in the current system to turn on it: they are it. Anwar Sadat made Egypt coup-proof by giving the military control of huge sectors of the economy (Amira Sonbol has compared it to the Mamluk iltizam system); Iran has done something similar. It makes it far less likely that the men with the guns will change sides. The handwriting on the wall for the Shah was when his "Immortals," the military elite, refused to fire on demonstrators. On ‘Ashura, some police did the same, but until and unless the IRGC does so, the cycle will continue to erode the regime's legitimacy, but probably won't bring it down. But then, revolutions do sometimes surprise us. I think the Administration's criticize-but-don't-directly-get-involved response is the right approach: almost all Iranians would rally behind a regime under American pressure or, unquestionably, American military assault. Let them play out their own revolutionary scenario, win or lose. 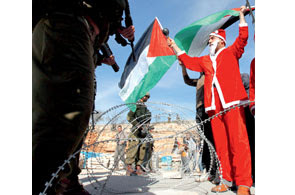 A photo for the season from the Gulf Times: Palestinian Santa Clauses demonstrating at the separation barrier near Bethlehem. Added later: as an aside, the one time I was in Israel/Palestine at Christmastime I saw equally skinny Santas showing up in both Ramallah and Bethlehem. They seem to have adopted the red suit and white beard meme from the West (mostly the US, but then most of Ramallah's Christians have kin in the US), but they didn't adopt the bowl-full-of-jelly plumpness. Or can't afford padding, I'm not sure which. Today was the Shi‘ite mourning day known as ‘Ashura; or rather, more precisely, it ran from sundown last night to sundown tonight, so it's over as I post this. It was a day of massive demonstrations in Tehran, as expected, since ‘Ashura coincided with the one week period of mourning for Grand Ayatollah Hossein ‘Ali Montazeri. The Shi‘ite practice came about because the Battle of Karbala' in 61 AH (680 AD), in which the Third Shi‘ite Imam, Imam Hussein, died along with most of his family, took place on the day. His martyrdom is the most mourned of all the Shi‘ite Imams, at least after Imam ‘Ali himself. During the reign of the Shah some of the more extreme practices, such as self-flagellation, were banned, but they returned after the Islamic Revolution. The emotion and redemptive symbolism of ‘Ashura make it a particularly explosive moment for Montazeri to have died. For a number of posts relating to ‘Ashura, including pictures of some of the art associated with it, check the last several posts at View from the Occident. 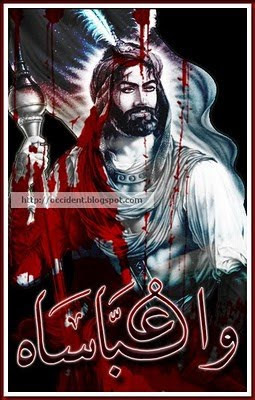 One of them, of ‘Abbas bin ‘Ali, Hussein's half-brother and a hero of Karbala who also died there, appears above. As I've noted previously, MEI's closed all week and posting will be light, but will occur. So hallowed, and so gracious, is that time. Merry Christmas. The Psalmist asked us long ago to pray for the peace of Jerusalem. Still seems like a good idea. I was going to post (still am in fact) some time over the coming three Christmases about the rich Coptic traditions of the "Flight into Egypt" and the many Egyptian towns and villages, churches, monasteries (and mosques) associated with the presence of Jesus, Mary, and Joseph. Until I get around to that I thought I should note that, as Christmas approaches, there has been a new wave of appearances said to be of the Virgin Mary in the Cairo area. The earliest wave, in 1968, got a lot of attention because of the number of Muslim witnesses. The church at which the supposed apparition took place, Al-Sayyida al-‘Udhra' Maryam (The Lady Virgin Mary) in the Cairo suburb of Zaytoun, has a website with photos of the apparitions, and several languages available (including Russian; link is to the English site). In 2000 there were claims of an apparition of Mary at Asyut in Upper Egypt. There's a video of it, which doesn't allow embedding, and this one I think is Saint Elmo's Fire, unless it's fake. Unlike the newer ones, it acts like Saint Elmo's fire on the church cross. You'd need to know the weather conditions to be sure. That one is stranger than the first, but it's still, essentially, light. And clearly, the crosses are lit electrically. Some kind of arcing effect? But it's Christmas. Perhaps I shouldn't be so skeptical: it's making Egyptian Christians appreciate the season. And people are seeing something, since they're photographing it. How they interpret what they see is a subjective matter. Like UFOs, lights in the night sky are hard to interpret. There is, of course, already a Facebook group following the story. And if it really is a miracle, the matter is above my pay grade. A group of Ashkenazi schoolgirls who approached the institute's side gate on Wednesday were driven away by a number of ultra-Orthodox men, who noticed Haaretz's photographer. "The court and media don't understand that this is another world," a mother who is keeping her daughter out of school said. "The Hasidic program was created because of a different religious outlook. Only pure children attend it." "The Mizrahi students' families don't belong with the other families," another parent said. "They have a television at home while the [Ashkenazim] speak Yiddish. The Mizrahi girls have a bad influence on our girls. No court will change anything," he added. "It's better for everyone to have separate study programs. This way each student keeps his identity - just like you wouldn't play Mizrahi and classical music on the same radio show," another resident said. The school has 215 students from first to eighth grade, 35 percent of whom are Sephardi. "It's a disgrace to this place, the ministry must intervene to stop the segregation once and for all," the father of one Mizrahi student said. "The Ashkenazis think they're more intelligent than we are, but what really bugs them is our skin color." I offer no further editorial content. The article speaks for itself. The Middle East Institute will be closed from tomorrow (Christmas eve) until January 4. I'll be fairly busy with family things during the period, but I do intend to continue blogging, especially on the subject of Christmas in the Middle East. (And also ‘Ashura, which is coming up.) Posting may be a little lighter than usual, however. Now that Saudi Crown Prince Sultan has returned to his own Kingdom after nearly a year in American hospitals and his palace in Agadir, Morocco, he's got his website going. Can a Twitter account be far behind? Also, has he got a new PR person? I've seen more broad smiling pics of Sultan in the last week or two than I can remember previously, and for some reason he seems to look 20 years younger than his early 80s age. (Maybe he has the Mubarak/Qadhafi gene under which your hair can't grey, but this pic doesn't look like a guy recovering from a serious cancer in his 80s. Oh well, welcome home. If it's a case of Sultan versus Nayef for the throne, I'll toss in with Sultan. I make no comparisons and suggest no parallels to the Saudi situation, but a decade or two ago in Louisiana, which has the most baroque politics in the United States, Edwin Edwards, a governor who, despite spending much of his gubernatorial salary and perhaps some of the treasury in Las Vegas and otherwise basically corrupt as hell, and who famously said he'd always be re-elected unless he was caught in bed with "a dead girl or a live boy," was challenged for the governorship by David Duke, a former Grand Dragon (or whatever) of the Ku Klux Klan and a racist with no qualifications for any known office, but who was doing disturbingly well in the polls. A bumper sticker quickly appeared: "Vote for the Crook: It's Important." Louisianans did. Clayton Swisher is a reporter for Al-Jazeera English, but before he was that, he was the Director of Programs for the Middle East Institute (and author of The Truth About Camp David), so I consider his reportage sort of part of the extended family's news. He's embedded in Afghanistan and sent me a couple of links to reports, one December 21 northwest of Kandahar, the other December 22 in Helmand. And thanks again to Al-Jazeera for being savvy enough to put their reports on YouTube and allow embedding. It gets their reportage a much broader audience. Some people prefer the cloakrooms and back channels of history to the front pages. One of these has died recently: Hasan al-Tuhami. His Wikipedia entry in English is as "stub" as they come; his Arabic one is better, if you read the language. It doesn't seem to know he's dead, but apparently he died last week. Don't worry that you've never heard of Tuhami. Ninety percent of his countrymen hadn't either. RIP Hasan Tuhami. He may be the real father of the Egyptian-Israeli peace treaty, and Google has trouble finding out that he died. Shadowlands. I think there are more pictures of Tuhami in Moshe Dayan's memoirs than in any Egyptian book. Though I gather he wrote one of his own, though I haven't seen it. I know a lot of my readers don't regularly read the comments to the posts: this isn't the sort of blog where huge, intense debates go on in the comment threads, and a post that generates 10 comments is pretty good. But sometimes my commenters provide essential information that I didn't have. The Kobza Vajk Group does indeed have Hungarian subtitles - Szentendre is an adorable little town up the Duna (Danube) from Budapest. Being a piper in the US (with a friend in Saudi who reads your blog), I enjoyed all the videos. Now let's look at the play-by-play here, or what a Muslim hadith scholar would call the isnad, or chain of authorities. I post a jeu d'esprit sort of thing about Arab bagpipes. One video is of a Moroccan bagpiper. I note the captions look maybe Hungarian. An American bagpiper who is familiar with the group knows the "adorable little town" in Hungary where they are based (though if his name is "Warner" he doesn't sound Hungarian). How did an American bagpiper find my blog? Via "a friend in Saudi who reads your blog." Bank shot. Try that with a dead-tree newspaper. * And if modern Aramaic interests you, by all means see this article in the Sunday Washington Post travel section on the Syrian town of Ma‘alula. I never got to visit it. (The Copts aren't represented but as an old Egypt hand I promise they'll have their own Christmas moment.) I'll have more. As I've noted previously, in the Middle East, you get three Christmases in a row. Sometimes, YouTube does all the work anyway. Montazeri's Seventh Day will Coincide with ‘Ashura: Critical Mass? I didn't post much on Grand Ayatollah Montazeri's funeral, which got pretty extensive general media coverage. There was little likelihood the government would crack down too violently on the funeral of a Grand Ayatollah revered as a major source of tradition. But the real test may be, as many have noted, the fact that the traditional mourning on the seven-day anniversary of his death, will coincide with ‘Ashura, the Shi‘ite day of mourning for Imam Hussein. That's going to be critical mass. Gary Sick comments that "It is possible that Ayatollah Montazeri will prove to be a more influential figure in death than he was in life." I haven't yet posted about the outrage over the Egyptian security wall along the Sinai/Gaza border because, first, Egypt denied it, and second, this is a crazy time with deadlines, massive blizzards, and the holidays. But sometimes events overtake intent. Here's The Arabist's post on this; this in a recent Ha'aretz, a piece suggesting "business as usual" for smugglers despite the wall; and there's a lot more out there. On the one hand, I understand that smuggling from Sinai into Gaza has been a big issue between Egypt and Israel; and the Egyptian government is no friend of the Hamas regime now in Gaza, since they are the Muslim Brotherhood of Egypt in their genealogy and genesis. Some kind of barrier has been inevitable, and it's not entirely clear that this is a major departure from what already existed. and if I'm going to complain about the Israeli "security barrier" as a new Berlin wall (and with Christmas coming to walled-off Bethlehem, I am), I really need to be consistent and say that a deeper, more impenetrable barrier between Egyptian Rafah and Palestinian Rafah really is troublesome. Like the Berlin wall: are you walling Gazans in, or outsiders out? Or both? I'd like to tear down all these walls. If you'd asked me if the Berlin Wall would fall in my lifetime I'd have said no (until 20 years ago, of course). I hope the separation wall falls, the Rafah wall falls, and everything that cuts people off from each other falls. But it's Christmas and I'm being altruistic. I imagine myself as Ronald Reagan (and believe me, I've never done that before, except possibly during Pride of the Yankees) saying, "Mister Netanyahu, Mister Mubarak, tear down these walls!" Once again, she's in her 70s now, which dates these clips. But as part of the whole Middle Eastern/Christmas season runup, here's another entry. Fairuz was born Maronite and became Greek Orthodox when she married into the Rahbanis, so she's entitled. The conservative wing of the Egyptian Muslim Brotherhood has carried the internal elections for the Brotherhood's Guidance Council, with some key reform figures (though not all) failing to win seats. Marc Lynch has a good summary, and Khalil Anani has some older background on the internal rivalries at his English blog, though nothing as recent on his Arabic blog. Here's the official announcement from Ikhwanweb (link is sluggish for some reason), the Brotherhood's official English website. Here's a straight news account. The next big question is who the new Supreme Guide (literally, General Guide) will be. Mahdi ‘Akef declined to run again, starting a succession debate and creating considerable factionalism. I'll try to write more at some point. 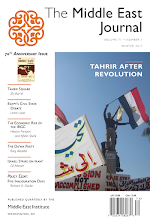 Later: for the Arabic readers, the Al-Masry al-Youm article on the "White Revolution" in the Brotherhood. And their English site for their take on the same story. Sa‘d Hariri finally took the road to Damascus yesterday, ostensibly to offer condolences on the death of Majd al-Asad but also because it was expected of him. Thoughtful comments as usual from Qifa Nabki, while Josh Landis posts on Hariri's poor Arabic. Grand Ayatollah Hossein ‘Ali Montazeri, once the heir apparent to Imam Khomeini until he fell out with that leader, has died in Qom at age 87. The leaders of the Iranian protest movement (for whom Montazeri had become a patron) have called for a national day of mourning. It should be noted that he died in the first 10 days of the month of Muharram, a period of Shi‘ite mourning that culminates in the feast of ‘Ashura, when mourning for Imam Hussein reaches its peak. That could make his funeral even more explosive. On second viewing I think they may be in front of the Sphinx, though it doesn't show except for the paws. If so, perhaps this is part of the Sound and Light Show. Now that's a Middle Eastern sound. And just to round things out in the Maghreb, the Algerian raï singer known as Cheb Mami: the bagpipes kick in about two minutes in (2:19 or so) and the photo looks a lot like the Tunisian mezoued. Catchy tune, too. I don't know much about raï, but this song's definitely listenable. So there. I may play it while I try to find my car under the giant snowball it has become. Marc Lynch's People of the Year 2009: Middle East Edition. While I'm tempted to do something similar I suppose I'd seem to be derivative. Some thoughtful choices, though. Greg Gause guest-posting at Lynch's site on the Kuwaiti confidence vote. A good background treatment. I haven't posted some recent MEI podcast links: the whole list is here; some good presentations, among them Tom Lippmann on Saudi Arabia, former hostage John Limbert and Trita Parsi (separately) on Iran, Claude Salhani on the Bush years, William Polk on Israel, Palestine, and the US. If You Thought I was Hard on the Swiss . . .
Israel-Syria: Is Something Going On? On that Bus Explosion Yesterday in Damascus . . .
Is Shalit Already in Egypt?